With so much talk about global warming, we need to be ecologically conscious in whatever we do. This festive season, let us see how we can fit in activities that are appropriate for Diwali but cause no damage or the least possible damage to our planet. Making a “bio-dynamic” greeting card!! Things needed: • Handmade paper • Scissors • Flowers and leaves of various hues (such as marigold, chrysanthemum, rose etc.) • Pen or sketch pens. Take a sheet of handmade paper. Cut it and fold it to the size of a greeting card. The colour of the handmade paper should preferably be light. Now take the petals of the flowers and rub them on the rough handmade paper. Make patterns or designs of your choice on the paper with the flowers and leaves. The flowers and leaves leave their colours on the paper. This is an extremely simple activity that requires the least amount of material. This is also an introduction to vegetable dyes for children. Take care not to rub too hard since it would then damage the paper. Also choose flowers and leaves that do not retain water in them, for this would make the paper soggy. Now go ahead and write out that message to your dear ones… wishing them a Happy and bright Diwali!! Things Needed: • Rice Flour • Turmeric powder • Kumkum powder • Lime powder (which is used in betel leaves or paan) • Coal – finely powdered • Dry leaves – finely powdered. 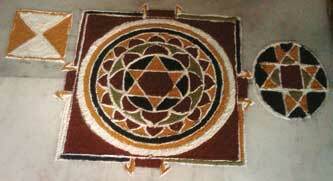 Draw a rangoli of your choice and fill it with the colours mentioned above. When you mix turmeric powder with lime powder, you get a deep red colour. These colours are easy on the environment and on our skin! You could also use these to colour the lamps. Mix a little water to the powders. You can use lime powder as a base and then apply the rest of the colours on top of it. Increase the quantity of the powders as per your requirement for light or dark shades of the hues. The range of colours may be limited, but it is important to take little steps that would keep us away from toxic colours. Keep looking around for different flowers that could be used for getting more colours. Conscious efforts go a long way in creating awareness and reverence for nature amongst children rather than mere preaching. The author works with Ananda, a foundation for holistic and healthy learning and living, www.anandaa.in. She can be reached at seethaanand@yahoo.com.